The Edgetec TriFlo Xtra-Heat Spa Bath Pump has the integral flat plate 700watt Stainless Steel heater built into the pump. 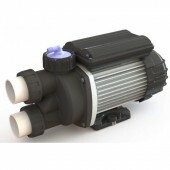 This will maintain your spa bath water temperature even in the largest spa baths. This pump is activated by the air button installed on your bath.